August's Mostly African Adventure: Sandwich Surpise! "What kind of meat is this? ", I wonder as I poke though my sandwich. It looked great on the spit, dripping fat as it slowly rotated over glowing coals. I can't quite put my finger on it, but it sort of tastes a little like a chicken coop smells and the meat ıs made up of tiny little rings. Best not to think about these things, I conclude as I take another bite. 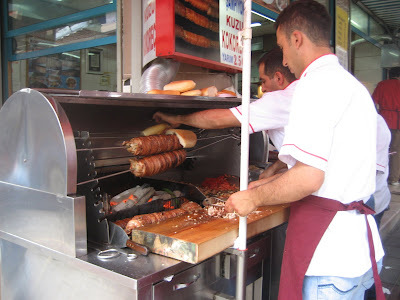 As soon as I landed here in Istanbul, I got right down to business by starting to sample all of the street foods I could find. Shwarma, duhrums, turkish delights, small green plum/apple things, nuts, fried fresh fish sandwiches (not as good as they sound), chocolate pudding, Raki (Anise flavored grape brandy), apple tea, feta, kabap (kabab) and a turkish pizza have all found a welcome home in my belly. Today is day three and I don't think that I've gotten through even half of the types of street food available here. I finish my sandwich and continue wandering the street, looking for my next snack. If anyone knows what type of meat this ıs, then please don't tell me. sorry, i couldn't help but look up the words I saw in the picture. well... there you have ıt. Thanks a lot Danıel. Ah, meat on a spit. Always a good idea. Especially at 5am after a night of drinking (speaking from personal experience).